Charlie Palmer Steak isn't just all about steak. If it was, that would make the community garden space pretty hard to explain. Executive Chef Jeffery Russell is about to debut a new farm-to-table program at the Capitol Hill steakhouse. Appropriately enough, it's called Jeff-to-Table -- and it's been a long time coming. 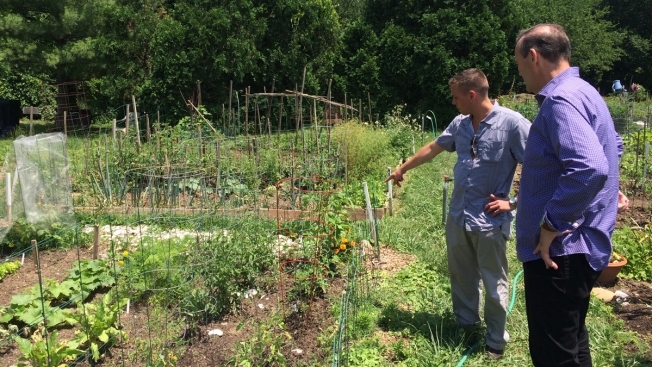 Russell had applied for a plot in Alexandria's community garden several years back, but it took until this spring for him to finally nab one, gaining the opportunity to grow fresh produce on the other side of the river. He begin planting in April -- once the ground finally thawed, the steakhouse notes. That provided just enough time to create a new summer garden menu, which launches Monday. The first menu features green zebra and bloody butcher tomato salad, Chincoteague skate wing, grilled Roseda Farms teres major, and garden-berry cobbler with housemade ice cream. Their menus' simplicity is something that Russell and owner Charlie Palmer admit is deceptively challenging. "A simple steakhouse is harder," Palmer said at a recent media event, but acknowledged he enjoys the challenge, saying if you begin with quality ingredients, the food speaks for itself. The $55 four-course dinner menu will change weekly, with wine pairings available for each course for an extra $20.